To buy shoes before the mass production of material goods took off, the customer would go to a specialty shoe maker and purchase hand-made shoes. The customer may have had limited choices, but the shoes could be made specifically for the customers feet, preferences and desires. Now, shoes are much cheaper, and we have an incredible number of options, but I believe we are on the verge of revolution in the level of specificity and customization available to customers. Nike recently put together a team of designers, engineers and programmers to create a new manufacturing process to produce shoes with a "sock-like" fit. What they came up with was the Nike Flyknit. 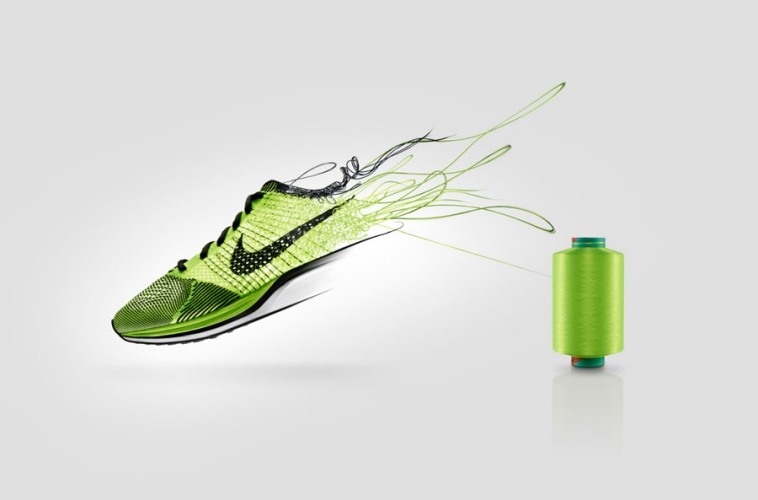 The Flyknit process uses computer-aided machinery to knit the shoes together. The new process allows for incredible flexibility and adaptability in the materials used and the design of the shoe that is knit. This starts to seem much like 3D printing, except now it's knitting shoes. With this technology developed, it is not a stretch to imagine a time when a customer could go to a Nike store, have her feet scanned, and have a pair of shoes custom-knit for her. The customer would not only get a pair of shoes that are built specifically for her feet, with adjustments made for the left and right foot, but would also have the opportunity to influence the style of the shoes through the colors and materials used. Customers could also take their foot scan to other companies to get all of their shoes customized to their feet. With an adaptive system, Nike will not have to manufacture a large quantity of shoes ahead of time to meet anticipated demand, but will be able to create shoes on-demand. They are also able to produce a superior product that fits the customer better, and that the customer has had a hand in designing, thereby increasing enjoyment of the product. When the system is in place, and able to make small adjustments, it creates the opportunity for the personalization and customization of products down to the smallest details. This paradigm would connect customers and manufacturers in a new way, allowing increased customization and a more interesting dialogue between both parties. And this wouldn't just be for shoes. A company called XOAB have created a process to knit more interesting sock patterns while still creating incredibly comfortable socks. While they aren't nearly as large as Nike (you can support them here), they have similarly adaptable process that allows them to produce individually tagged and customized socks. This new paradigm of shoe making would also allow companies like Nike to be even more creative in how they design shoes. The experts and R&D departments can still discover ways to build more efficient and comfortable designs. Customers and independent designers could submit designs into on online space where the top designs then become available. Customers could have access a wide variety of shoe models instead of just this years models. I imagine runners would be pleased to be able to have the same exact shoe knit for them year after year instead of finding that their favorite shoe has been changed in the next years model.